In late 2007, a year after the Bedlam Six was formed, we started recording an album called Found Drowned. The line-up was a little different then, the dominant sound for much of it was a string section provided by Hannah and Georgina from The Moulettes (a phenomenal band that you should investigate forthwith if you’re unfamiliar with their work). In total there were over a dozen players involved (plus a twenty strong choir of drunks that features on a couple of tracks). We bit off way more than we could chew. For a start we had no real idea of the kind of band we were then or how we’d evolve in the subsequent years (we were very much a folk band with traces of rock and swing rather than the other way round) but also (and this is the really important bit) we didn’t actually know how to record an album. We recorded thirteen tracks over ten days in the Withington house I used to share with Cleg the Bedlam guitarist (twelve made the finished record). It was a wild and confusing time, very much a do-as-much-as-you-can-and-we’ll-sort-it-out-later process. I remember spending weeks with Dan (our engineer and bassist) chipping away at the post-production, trying to find the songs among the confusion of noises. I think it sounds remarkably good considering our inexperience and the rather impoverished set-up. But since then we’ve been trying to perfect the way we record. Trying to catch the live chemistry whilst simultaneously adding the kind of subtlety not available when stomping about on a stage. 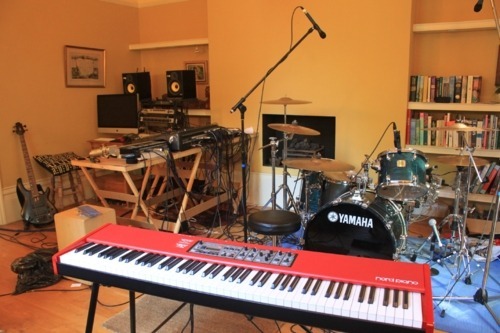 We’ve used professional recording studios and we’ve recorded live concerts; both have their charms and advantages but neither are ideal when attempting to make something a bit, well, special. Last year we decided to go back to basics and follow the lead of our heroes The Band, creating our very own Big Pink – a house on the south coast of England far away from the distractions of our Manchester lives, a place we could all live and work in, somewhere we wouldn’t have to watch the clock, where we could relax and focus solely on the project at hand. That’s where we recorded our EP “Memoir Noir”, in my opinion the most honest record we’ve ever made. It is what I think all records should be: a moment in time. So we’re going back there. Indeed, we are back there now. Today is the first day of a three week stretch in which we intend to record our difficult second album, five years after our debut. We know each other a lot better now, I’d even go so far as to say we know ourselves a lot better now. There’s a lot of debate about the relevance of albums now that the way in which people consume music is changing so much. But as long as there are people who still favour the Long Player format then we’ll keep making them. I like albums. Everyone in the band likes albums. There is a peculiar majesty to a good album that exists far outside a simple arrangement of songs. So now we’re locking the doors and closing the curtains on the outside world, when we come out again we’ll hopefully be clutching a piece of work that we all really like. And hopefully you’ll like it too.